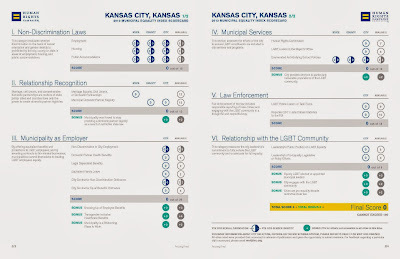 KANSAS CITY, KAN. ---- According to the Human Rights Campaign's Municipal Equality Index scorecard, Kansas City, Kan., is among a handful of cities that ranked dead last nationwide in the LGBT Equality Index. 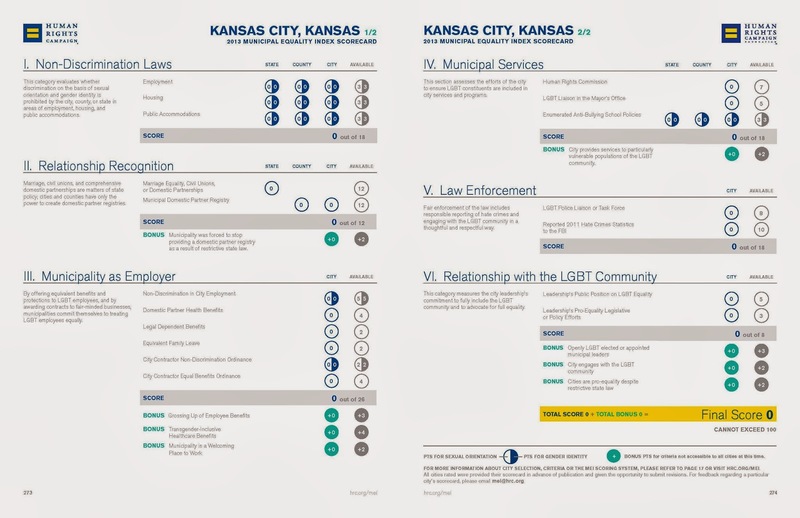 The study uses a number of criteria points to measure a city's "acceptance" of the lesbian, gay, bisexual and transgender community. Among the criteria points examined - laws in the city, policies, benefits and services. Law enforcement practices were also graded. Out of a possible 100 points, KCK did not receive a single point. On the contrary, Kansas City, Mo., received a perfect score of 100. Lawrence, Kan., scored a 22 on the scorecard, while Overland Park checked in with a 27 and Topeka earned a score of 32. Click the image below to see KCK's grade card.